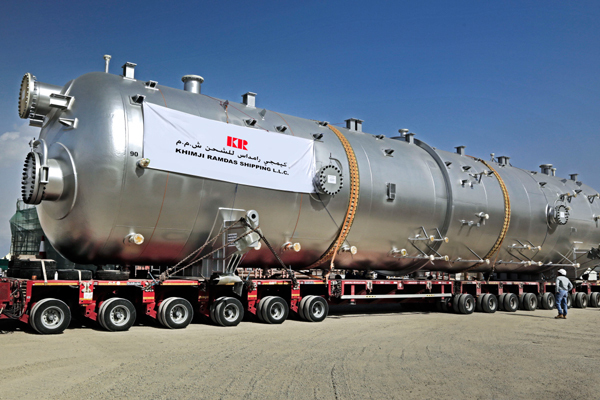 Khimji Ramdas Shipping recently partnered with Ceco Environmental Peerless Manufacturing Company as inland haulers in Oman for the export of high and low pressure separators made in Oman. The haul, executed in coordination with the Ministry of Transport and the Royal Oman Police (ROP), involved 1200-metric tonnes of finished products to be transported over 700 km from Nizwa to the Port of Duqm and the subsequent loading onto chartered ships heading to Kuwait. “The event was picked amongst many prestigious bidders for this massive operation that involved obtaining special permits from the related ministries and the ROP, customs clearance, stool-down, and port coordination amongst others. Through years of expertise and strong relationships, the company has executed the assigned tasks seamlessly which is highly commendable; we indeed are glad to have made the right choice,” he said. Separators are pressure vessels used for separating an oil well stream into gaseous and liquid components. Manufactured by Special Technical Services (STS) an oil field equipment manufacturing company, the separators are the first-of-its-kind to be exported from the sultanate. “Our expertise and experience were illustrated whilst handling this heavy and out of gauge cargo in their haulage from Nizwa to Port of Duqm. We also facilitated the load out of the separators on to the vessel carrying them to their final overseas destination,” Jose said. “This being the first ever export of such separators from Oman, makes the shipment a special one and we are so proud to be associated with. It is also an opportunity for us to demonstrate to the Project Handlers around the globe the capabilities of Oman to provide effective logistics solutions for all types of cargo movements in an attempt to promote Oman as a major logistics hub in the region for heavy cargo discharge, storage and distribution,” Jose added. Throughout the past few years, Khimji Ramdas Shipping had systematically extended its services to every segment of Logistics. Project cargo handling started in 2016 after having adequate technical team on board, the same year Khimji Ramdas Shipping moved two rigs for an oilfield in Oman and also a sea mining dredger.